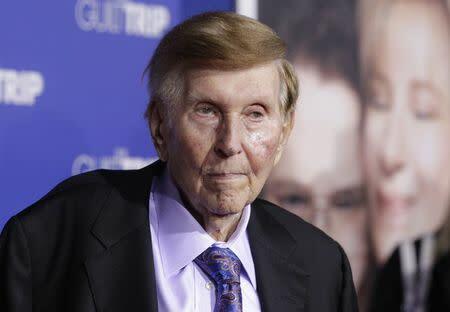 (Reuters) - Sumner Redstone made clear on Friday that he is considering ousting Viacom's <VIAB.O> chief executive and the company's board of directors in the fierce power struggle between Redstone's family and company executives over control of the media empire. A judge set an early June hearing on the possible removal of CEO Philippe Dauman from the trust that will control the media company when Redstone dies or is deemed incapacitated. In a statement issued through a spokesman, Redstone, who turned 93 on Friday, said he would act in "the best interests of shareholders," when weighing whether or not to oust Dauman and the company's board. Redstone, who holds 80 percent of the voting shares in Viacom <VIAB.O> and CBS Corp <CBS.N>, last week removed Dauman and Viacom board member George Abrams from the seven-person trust that will control the shares after Redstone exits. In the statement, Redstone said he will apply "the same deliberation and consideration" he used when he removed Dauman and George Abrams as trustees. Redstone's latest missive comes amid reports that Viacom's board is preparing a lawsuit challenging any attempts to remove its members or the CEO. Judge George Phelan scheduled to hear the case on June 7, after Dauman filed a petition to have the trial date expedited. A spokesman for Dauman and the Viacom board was not immediately available to comment. Viacom's shares are up 13 percent since news broke last Friday that Redstone had removed Dauman and Abrams from the trust and the National Amusements Board, as some investors bet that a change in management could lead to a sale of the media company. Mario Gabelli, the second-largest owner of Viacom voting shares, has said Dauman has six months to turn the company around. Also on Friday, Standard & Poor's revised downward its assessment of Viacom's management and governance to "fair" from "satisfactory" because it believes the litigation and succession planning issues "reflect poorly" on Viacom's corporate governance. Dauman has tried to turn Viacom around by wooing advertisers with data to better target commercials. Under his leadership, Viacom renewed a multi-year distribution contract with satellite TV provider Dish Network Corp <DISH.O>. But it was Dauman's plan to sell Viacom's stake in Paramount Pictures, which investors cheered, that caused him troubles. Redstone, who won a long battle with media mogul Barry Diller to acquire the film studio in 1994, opposes the sale of the stake. Frederic Salerno, Viacom's lead independent director, on Wednesday asked for a meeting with Redstone to discuss the company's strategy, including its planned sale of a stake of Paramount. Redstone has not yet responded, a source familiar with the situation told Reuters on Friday.